After lunch in Lahaina, we drove on to Ka’anapali where our hotel was located. After checking in, we decided to explore the nearby area that we could walk to, with a quick jaunt to the beach at Ka’anapali. A brief afternoon shower had us heading back to our hotel room for a quick afternoon nap and the afternoon spent admiring the gorgeous view of the Pacific Ocean and a glimpse of the island of Lanai from our lanai (balcony). As the sun was getting ready to set for the day, we got back in our rental car to drive back to Lahaina where we enjoyed a beautiful sunset view right along the waterfront at Front St. With the sun down, it was time to fill our bellies at a restaurant often called Maui’s best, and sometimes referred to as one of Hawaii’s best restaurants. Just off of Front St. about a half a block is the famous Lahaina Grill. Well known by locals and visitors alike, Lahaina Grill has been voted as Maui’s best restaurant for a quarter of a century. What I love is that even though this is considered more of an upscale, high class eatery, this is Hawaii and everything is relaxed and laid back, so there were people dining in a full range of nice dresses and suits to more casual and relaxed jeans, shorts and flip flops. The main dining room of the restaurant revolves around a large bar that sits near the front of the restaurant with tables situated all around the remaining space in the dining room. We were seated at a nice window table at the front of the restaurant right near the bar, but with a beautiful view to admire both the restaurant interior as well as doing a little people watching right out the front windows of the restaurant. Serving local and fresh Maui fare with an emphasis on seafood, the Lahaina Grill was a total gem and standout restaurant selection. 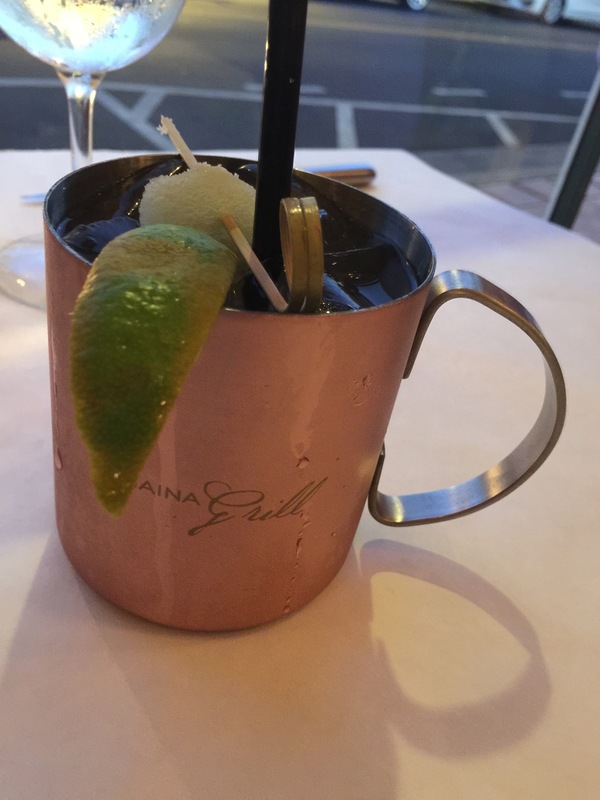 To start off our meal, my husband decided to order the Maui Mule, it’s Lahaina Grill’s version of the famous Moscow Mule. Made with local Pau vodka, fresh lime, ginger liqueur, ginger beer and crystalized ginger all served in the traditional copper cup. My husband said that the drink was very refreshing, especially considering how warm and muggy Hawaii can be at times, this was a great refreshing drink. However, he did say that he wished there was just a bit more ginger flavor and a little less lime, but my husband is a fine of the bite of ginger, so it isn’t surprising that he’d say that. As a starter, I decided to order a cup of Maui onion soup. 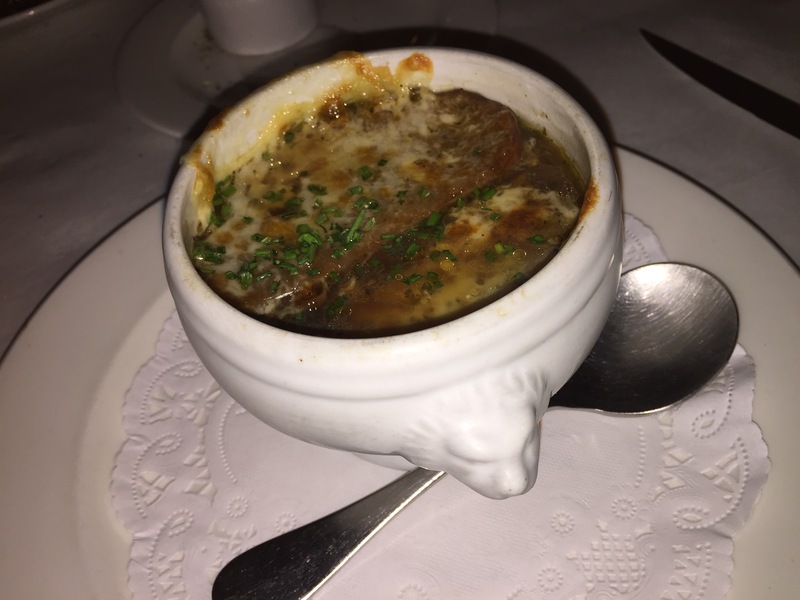 As a big fan of French onion soup, Maui onions are well known for their distinctive sweet taste, so I couldn’t resist ordering a cup of soup made with Maui onions. The soup was described as sweet Maui onions simmered in a rich beef and chicken stock, sherry and baked with a gruyere and provolone cheese crouton. The soup was very good, the broth was rich and full of flavor, but not heavy, which was fantastic. I think it was the combination of using beef stock and chicken stock. The beef stock is the hearty, beefy full flavor of the broth and the chicken stock keeps it lighter so it’s not so heavy. The Maui onions are sweet, subtly, so, making the flavor of the soup fantastic. The tender onion was a perfect pairing for this soup. And boy, oh boy, the cheesy crouton was amazing. The crouton was still tender and had soaked up all of the flavors of the broth, and the cheese was perfectly melted and ooey and gooey all over. My husband decided to order the seared ahi and Hudson Valley foie gras dish for his starter. Our waitress said that was one of her favorite dishes and promised that my husband would not be disappointed. 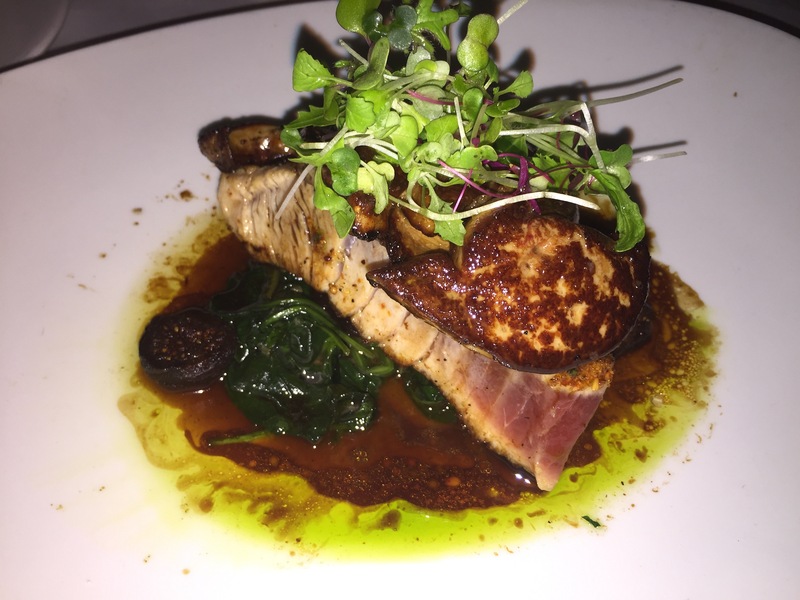 The seared ahi and foie gras was served with a fig compote, sautéed spinach, drizzled in truffle oil and poured over with a maui onion demi-glace. When the dish was brought out to the table, it smelled amazing and looked mouth watering. And this plate was bigger than any appetizer I’d ever seen. This easily could have been, and probably should have been an entree dish. I’d never seen an appetizer dish like this before. Even the seared ahi alone could have been an entree, but add in the Hudson Valley foie gras and it was beyond over-the-top. One forkful and my husband was in heaven. The flavors of the seared ahi were unbelievably good and fresh. The tuna was just seared on the outside and perfectly fresh and raw on the inside. The foie gras was amazing and was like butter, it just melted in your mouth. It was such a good combination of foie gras and seared ahi that my husband told me that I needed to try a bite, even though he knows that foie gras isn’t my favorite thing. I must admit that all of the flavors of the dish just melded together so perfectly it was a combination made in food heaven. 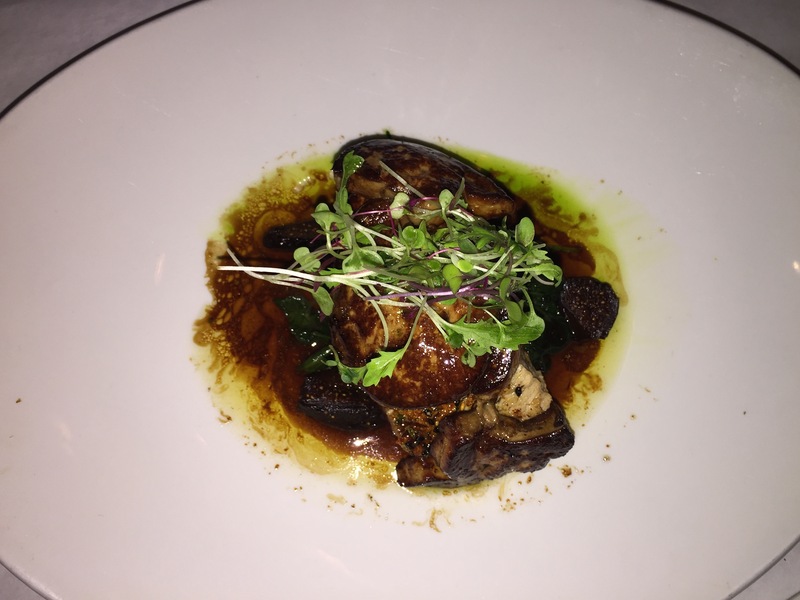 And even the size of the cut of ahi tuna wasn’t a complete surprise, the Lahaina Grill served up the 3 slices of foie gras over the tuna, it was so ultra generous and luxurious. The Maui onion demi-glace and the sautéed spinach were just amazing. It was the flavor of the demi-glace that broke up the richness of the combination of the fatty tuna and the ultra fatty foie gras. And as I mentioned, the aroma of the dish was just beyond amazing. My husband says this is the best foie gras dish he’s ever had tasted. How could dinner get any better when we started off with some amazing appetizers? For my dinner, I ordered the seared lion paw scallops served with celery-potato root mash , roasted sweet corn relish, sweet pancetta chips, truffle oil and lobster champagne beurre blanc. This was seriously the best scallop dish I’ve ever tasted. The scallops were huge, and perfectly cooked. Tender and sweet, they were just perfect. The roasted corn relish with the crisp pancetta was perfect. Roasting the corn gave it another level of flavor and that slight bit of char just added to the dish. The pancetta added the right amount of saltiness to the dish, and the celery root puree was smooth and creamy and just soaked up all of the flavor of the relish and the rich beurre blanc. The roasted asparagus was icing on the cake, so to speak and added a brightness to the dish. 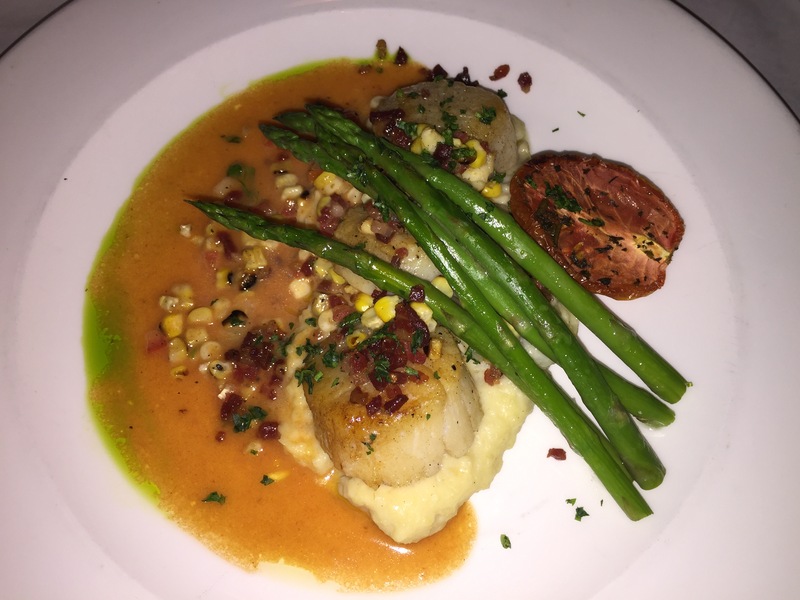 But the real star was the scallops and how incredible their flavor was, and how tender. Who would have thought that three scallops could make an entree, but these had to be the biggest scallops I’ve ever seen. What a perfect dish. After a recommendation from the valet at our hotel, as well as the recommendation from our waitress that this was the dish that the Lahaina Grill was most well known for, my husband ordered the Opakapaka. Opakapaka is Hawaiian pink snapper that is locally caught and served fresh daily. In fact, as the signature fish served at the Lahaina Grill, the opakapaka is served each day as the house special with different sauces and accompaniments based on what’s fresh and local in the market and seasonal for the island. The night we dined, the opakapaka was served with an Asiago-panko crust over creamy truffle risotto, alongside grilled shrimp and a wild mushroom champagne beurre blanc. My husband loved the opakapaka, it was really light and mixed in flavor which allowed it to soak up all of the flavor of the wild mushroom beurre blanc and the truffle from the risotto. The pank0-Asiago crust was perfectly cooked with a light crunch and stayed on the fish really well. The creamy truffle risotto was rich and ultra luxurious. First my husband has ahi tuna and foie gras and then finishes it with truffle, how much more top shelf can he get? 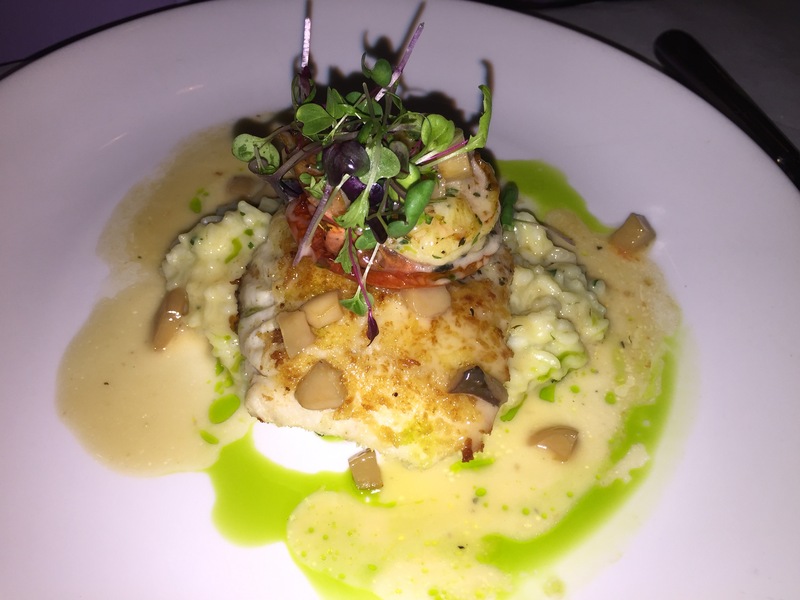 Between the size of his appetizer dish and the heartiness of the large file of fish and creamy truffle risotto, my husband was stuffed to the gills. By the time we were done with dinner, amazingly, we were both stuffed to the gills. After the size of his appetizer, followed by the incredible entree, my husband was so full he didn’t think he could eat another bite. Surprisingly, I was just as stuffed. However, we’re on vacation, and how could we not order dessert? Besides, when we told the valet at our hotel that we were dining at the Lahaina Grill, he actually gave us a coupon for a free dessert, so we couldn’t actually say no to dessert. After perusing through the dessert menu, we decided to split the Kauai pie. Made with a chocolate shortbread cookie crust stuffed with a Kona coffee ice cream filling, the pie was layered with chocolate fudge and topped with coconut flakes and macadamia nuts. Ok, so I know I said I was stuffed, but when the Kauai Pie was brought to the table and it looked like this, I suddenly found myself hungry for some dessert. You just can’t resist an ice cream pie that looks like this and tastes just as amazing. 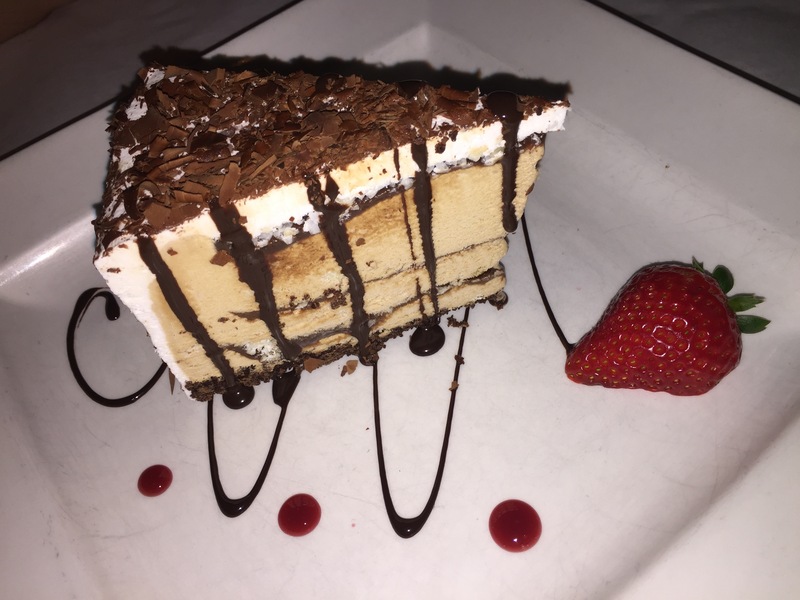 With this being an ice cream pie, it was actually quite light and therefore, was so much easier for my husband and I to enjoy. The taste combination of the macadamia nuts and coconuts and the Kona coffee ice cream was really terrific. The macadamia nuts gave the ice cream terrific texture and crunch, and the coconut flakes added a really tropical flavor. The Kona coffee ice cream had a terrific coffee flavor that wasn’t too strong in the pie. The chocolate shortbread cookie crust was fantastic and a classic Hawaiian flavor. Finally, finishing it off with the chocolate shavings atop the slice of pie provided a perfect sweet ending. From the first bite of each of our starters, my husband and I knew we had found a winner of a restaurant. 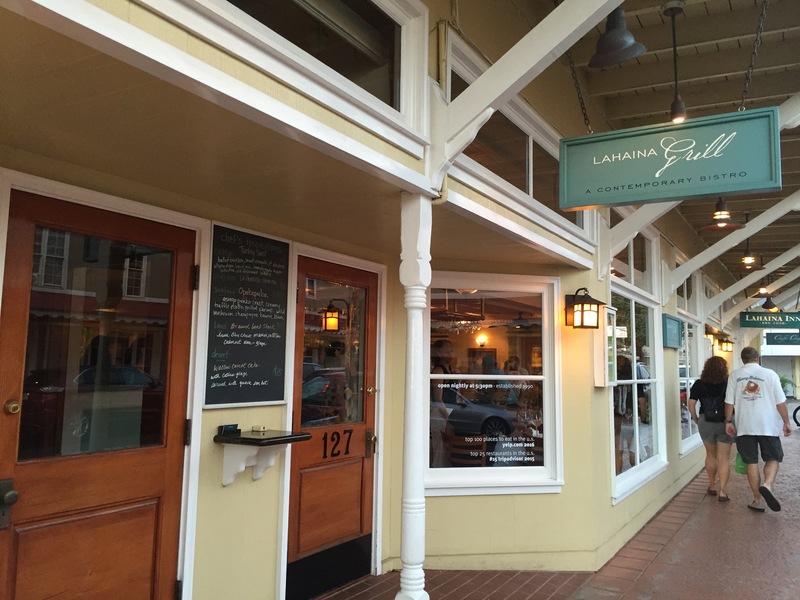 There’s no doubt that the reputation that Lahaina Grill has is well deserved. It’s not easy to be a top restaurant year after year after year, but if Lahaina Grill continues to churn out the flavors, the freshness and the quality of the products it delivered to our table when we dined there, it will continue to be Maui, and Hawaii’s best restaurant for decades to come. Our meal at Lahaina Grill was like taking in all of the flavors that make Maui so special and make Hawaiian cuisine so unique and special. This is one restaurant I would not hesitate to recommend to anyone on a trip to Hawaii, and one that my husband and I will definitely go back to next time we find ourselves in Maui.